This chapter provides an overview and thus contributes to a better understanding of the world’s groundwater resources, their distinctiveness and their governance. It describes the principal elements of and key instruments employed in groundwater governance. To this end, the authors introduce several case studies from across the globe and offer some corresponding lessons learnt. In particular, this chapter presents an analysis of the role of monitoring and assessment in groundwater governance, showcasing the example of The Netherlands. A global diagnostic of the current state of groundwater governance is provided, based on information from a set of commissioned thematic papers and the outcomes of five subsequent regional consultations carried out within the framework of a GEF-supported project on Global Groundwater Governance. It includes insights into some of the findings of that project regarding the four main components of groundwater governance: actors, national legal frameworks, policies and information and knowledge. 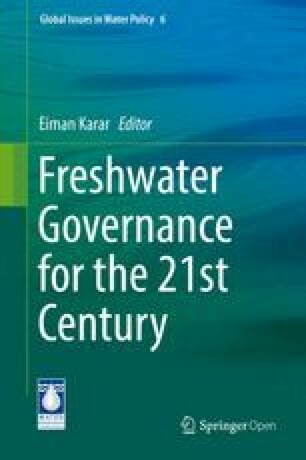 In addition, the authors address the issue of governance of transboundary groundwater resources and the relevant existing international legal frameworks. In conclusion, through a Global Vision for 2030, the chapter presents a way forward to govern groundwater and a Framework for Action to achieve good governance, formulated by the Groundwater Governance Project jointly implemented by UNESCO, FAO, World Bank and IAH. Groundwater is an extremely important source of freshwater on earth: its global flux amounts to some 28 % of the total global freshwater flux, and even around 98 % of the world’s liquid freshwater reserves are stored underground, which makes groundwater a unique buffer capable of bridging prolonged dry periods (Margat 2008; Margat and van der Gun 2013). Worldwide, 2.5 billion people depend solely on groundwater for their daily needs (UN WWDR 2015), and the volume of groundwater abstractions is increasing between 1 and 3 % annually (Margat and van der Gun 2013; Wada et al. 2013). Simultaneously, contamination of groundwater is becoming a more widespread problem, and the negative effects of groundwater abstractions are increasing, for example, on groundwater-dependent ecosystems. Climate change and variability are affecting the recharge of groundwater (Taylor et al. 2013) as well as the demand for groundwater, while population growth and improved well-drilling and development techniques also lead to increased demand. Understanding the significance of groundwater governance is a critical part of recent, non-technical, “soft” approaches to managing the “water crisis”, which some long-time observers have termed “mainly a crisis of governance” (Mukherji and Shah 2005). Principles of governance, if appropriately identified and applied, can yield effective groundwater management policies, which can result in practices for “responsible groundwater use”, including attention to equity, sustainability and efficiency (Varady et al. 2013). The notion of (environmental) sustainability, accepted in the 1990s, features a number of corollary precepts, all of which are relevant to groundwater: “context matters” and one-size-fits-all solutions are illusory (Ostrom 1990); integrating groundwater management within other aspects of socioeconomic development is indispensable (viz. IWRM or integrated water resource management), and to be most effective, expertise should be harnessed across a full spectrum of disciplinary approaches, including the social sciences and law; communities of practice (CoPs), such as those among government authorities, scientists and water users, are catalysts for effective management of resources, while the involvement in decision-making of non-state actors and diverse stakeholders, such as communities, is a component of most successful resource-management approaches; and finally, political motives such as power concentration, equity and ethics are key factors in national, international and transboundary matters. Beyond financial and hydrological considerations, key obstacles to improved management include the lack of reliable information on groundwater resources, extensive institutional and territorial fragmentation in a sector with numerous stakeholders at different levels, and significant spillover effects in other policy areas such as agriculture, spatial planning and energy. In addition, groundwater management is confronted by the invisibility of the resource and the persistent myths of its inexhaustibility, cheapness and universally high quality (Varady et al. 2013). Another distinct feature of groundwater is that its exploitation is extremely dispersed in space and predominantly in the hands of the private sector such as irrigation farmers, water supply companies or domestic well-owners. Therefore, to a large extent, managing groundwater quantity means influencing the decisions and behaviour of numerous individuals. This is in contrast with the exploitation of surface water quantity, in which relatively large engineering infrastructure and the public sector often play a much more prominent role. All these peculiarities of groundwater make its governance and management rather different from surface water management and governance. Moving from the loftiest to the most functional notion, we offer working definitions of three related but fundamentally different terms: governance, policy and management. Governance is generally understood to imply a societal process (Lautze et al. 2011). For the World Bank (1991), it is more specifically “the exercise of political authority and the use of institutional resources to manage society’s problems and affairs”. A useful corollary views governance as “the sum of the many ways individuals and institutions, public and private, manage their common affairs” (Commission on Global Governance 1995). The GEF-supported Groundwater Governance Project, implemented by the Food and Agriculture Organization (FAO) jointly with the United Nations Educational, Scientific and Cultural Organization (UNESCO), the World Bank and the International Association of Hydrogeologists (IAH), adopted the following definition of groundwater governance: “groundwater governance comprises the promotion of responsible collective action to ensure control, protection and socially-sustainable utilisation of groundwater resources and aquifer systems for the benefit of humankind and dependent ecosystems. This action is facilitated by an enabling framework and guiding principles” (Groundwater Governance Project 2016b). While the concept of “policy” has become pervasive, working definitions remain elusive. The Merriam-Webster Dictionary (2011) defines policy as “a definite course or method of action…to guide and determine present and future conditions”. For the UN’s Food and Agriculture Organization (FAO 2011), policy is “a set of decisions which are oriented towards a long term purpose or to a particular problem”. This simple and succinct definition captures the centrality of the vital term, “decision”. If we understand the policies to be made by all sectors of society with a stake in governance – not just government – then policy-making can be considered synonymous with decision-making. Once policies have been formulated, putting them in place requires instruments, tools, rules, protocols and other procedures. These may include laws, sets of rights, registrations, permits and regulations (especially regulations that allow those regulated to choose among alternative ways of complying); economic incentives and disincentives such as subsidies, taxes, tradable pollution permits and pricing structures; and civil-society actions such as those that motivate voluntary actions or behavioural changes (Theesfeld 2008). The term “management” is perhaps easier to grasp intuitively than “governance”. Management can be thought of as the “nitty-gritty of day-to-day operations” that emphasises the results of decisions (Linton and Brooks 2011). Other similar notions are “approaches, models, principles, and information used to make decisions” (Bakker 2007, cited in Nowlan and Bakker 2010); “regimes based on institutions, laws, cultural factors, knowledge, and practices” (Solanes and Jouravlev 2006); or purposeful activities that enable the accomplishment of goals and objectives (Pahl-Wostl 2007). These definitions share a concern for routine, practical and effective ways to achieve predetermined objectives and proceed with a common caveat: recognition of conflicting interests (Wolf 2007). Economic instruments (groundwater pricing, environmental taxes, tradable rights and groundwater markets) and behaviour-changing instruments (training, information sharing, awareness-raising). Moench et al. (2003) argue that this relatively recent, instrument-based approach presumes extensive knowledge of the physical and social dimensions of the groundwater system and sufficient organisational capacity to implement changes in a planned and integrated manner. There are many examples of management and governance models, along with evaluations of their effectiveness and discussions of lessons learnt. We offer four selected cases: two contrasting models in developing countries, namely, western India and China, and two distinct approaches in more industrialised, though water-short societies, namely, Spain and Arizona (USA). Some studies on groundwater management highlight self-regulation as a governance model (Van Steenbergen and Shah 2003). For example, in the State of Gujarat, India, when government efforts failed to address the over-exploitation of groundwater and coastal groundwater salinisation, some local communities began to harvest excess rainwater during the monsoon for aquifer recharge. Based on informal rules, and inspired by a local spiritual Hindu leader, the grassroots movement grew fast. The early adopters became agents of change, inspiring neighbouring farmers in nearby villages and operating as an open and inclusive network. Although the initial focus was on increasing water supply, some demand-side practices, sanctioned by local religious practices, were also adopted. The movement received public recognition from the state government, resulting in a pluralistic coexistence of formal governmental groundwater legislation and informal movement norms and rules. This case exemplifies public-private partnership with cooperation between government departments, citizens, communities, religious-based organisations, NGOs, and the private sector. Groundwater management strategies in India can be contrasted with those in China (Mukherji and Shah 2005). Since the 1950s, both countries facing high population density and embracing food self-sufficiency and an agriculture-based economy have relied on groundwater irrigation for their massive agricultural production (Siebert et al. 2010). In both countries, this practice has led to overexploitation with consequent groundwater table declines in significant parts of their territories. In contrast to India’s regionalised and even localised approach to groundwater management, China’s approach has been much more centralised. Each Chinese village features a governmental agent paid from villagers’ taxes with the responsibility to plan and manage its irrigation. Such officials provide guidance for price-setting mechanisms in groundwater markets. Differences between the Indian and the Chinese experience illustrate the roles that both the macro-development path (Shah 2007) and the overarching political regime play in the shape and scope of groundwater governance. Traditionally, with a strong governmental bias towards surface water infrastructure, Spain offers an example of how past practices and policies influence and constrain present groundwater governance (Llamas 2003). Spain has one of the highest numbers of surface reservoirs per capita and large interbasin river water transfers. In large part, this is due to past failures associated with groundwater dependence for public water supplies. This experience has prompted a myth that assumes that groundwater use always leads to the depletion of the source rendering it unreliable. The Spanish Water Code of 1985 placed groundwater resources within the public domain. However, because of the historic notion of groundwater as private property, registration and licensure have been difficult to achieve. The 2001 National Water Plan appears to challenge the old paradigm of surface water infrastructure development. For the first time, it has provisions that strongly support the management of groundwater resources, and it fosters the formation of groundwater-user communities and education of the public on groundwater. An interesting case study is that of the arid and strongly groundwater-dependent state of Arizona in the United States. Aside from drinking-water quality and discharge standards, which are established at the national level, the individual states retain the discretion to establish their own groundwater rights and management systems (Gerlak et al. 2013). Arizona’s 1980 Groundwater Management Act (GMA), along with its regulatory framework for aquifer recharge, has enabled the deployment of innovative approaches to managing groundwater in hydrologically mapped regions that had experienced significant groundwater overdraft. Key to the GMA was the establishment of statutory management goals for a set of active management areas (groundwater management jurisdictions), as well as a programme of assured water supply, whereby new municipal developments are required to show they have legally, physically and continuously available water supplies for 100 years. The GMA also requires municipal, industrial and agricultural conservation programmes. Despite this progressive management and governance framework, groundwater management challenges remain. These include absence of consideration of environmental water uses and localised drawdown of aquifers (Megdal 2012; Megdal et al. 2015). One of the above-mentioned technical instruments in support of groundwater governance is groundwater monitoring, the practice of observing changes in the state of groundwater resources. Observations about groundwater can include but are not limited to groundwater levels, quality and abstraction volumes. Measuring changes in the state of groundwater in a reliable and sufficiently detailed way depends largely on well-designed and maintained networks of groundwater wells. Groundwater governance and monitoring are interdependent; good groundwater governance depends on a suitable understanding of the resource being governed, including processes affecting the resource such as the effects of human interaction and policies. Groundwater monitoring provides information to create this understanding. Assessment then uses this understanding to characterise the needs of the resource and its users to provide a sound basis for governance and management. Monitoring and periodic assessment allows relevant stakeholders to systematically improve resource management based on measured outcomes, i.e. adaptive management. At the same time, it is the practice of good governance that needs to provide the right framework to put monitoring and data collection in place. The importance of groundwater monitoring is gaining traction at the international level. The United Nations General Assembly Resolution on the Draft Articles on the Law of Transboundary Aquifers (UNGA 2008) includes Article 13 which requires monitoring by states sharing an aquifer. Going further, the United Nations Economic Commission for Europe Convention on the Protection and Use of Transboundary Watercourses and International Lakes has more elaborate provisions for groundwater monitoring and its objectives (UNECE 1992). The most descriptive is the European Union Water Framework Directive (WFD), which states in Article 8 that monitoring programmes are required and provides technical design specifications in Appendix V (EC 2000). Further monitoring objectives specific to groundwater quality are described in the EU Groundwater Directive (EC 2006). The increasing attention given to this practice at the international level is a reflection of the broader importance of groundwater monitoring. Lack of monitoring and assessment of groundwater resources can limit the effectiveness of policy-making and groundwater management, two essential elements of groundwater governance. To be effective, the development of groundwater policies and laws should take into account existing knowledge about groundwater systems, especially if they are designed for a specific aquifer. Groundwater monitoring contributes to this knowledge by mainly measuring groundwater levels, groundwater abstractions, spring discharge and water quality (Vermooten and Kukurić 2009). Once these monitoring data are available, they can be assessed and used to evaluate whether particular policy objectives have been met or need adjusting (adaptive management). Therefore, gathering data about groundwater resources has a clear role in effective groundwater governance and assessment of groundwater resources. However, gaps and asymmetries in groundwater data pre-empt attempts at good groundwater governance, comprehensive assessment or the fulfillment of management objectives such as conservation and protection (Theesfeld 2010). Development of groundwater laws and policies should include mechanisms that facilitate groundwater monitoring. In order to ensure that groundwater monitoring takes place, an effective national (ground)water law should, at a minimum, define an obligation for groundwater monitoring and the overall objectives for the monitoring. Additionally, it should describe funding mechanisms and how rights of access will be granted for monitoring, determine whether all or some groundwater abstractions must be monitored and reported, as well as details on how results of monitoring will be made publicly available (IGRAC 2008). Administrative responsibility for the monitoring has to be assigned, and guidelines for reporting need to be provided. To be able to design a monitoring network, the objectives stated in the laws and policies need to be translated into technical objectives, which include, for example, determining groundwater flow directions, defining recharge and seepage areas, and characterising groundwater quality of the observed region and its suitability for various types of use (Jousma and Roelofsen 2004). By elaborating these technical standards in a policy, a groundwater governance regime would have the technical foundation necessary to complete a comprehensive assessment of its groundwater resources. Comprehensive assessment would not only entail analysis of the data provided by the groundwater monitoring network but also interpretation of those data for the purposes of creating an overview of the physical characteristics of the resource (flow volumes and dynamics), the human uses (domestic, agricultural, industrial), threats of and vulnerabilities to contamination and the ecosystems connected to the groundwater resource. Such an assessment would also indicate how these various features might interact at different times of year or as a result of changes in related environmental resources or human activities. Proper assessment might even include predictions of how factors such as population growth and climatic variability would affect groundwater. With this type of assessment, those seeking to govern groundwater would be better able to prioritise and to make strategic decisions about how to sustainably utilise the resource. Groundwater monitoring networks can be classified as general reference primary networks or specific secondary networks based on their differences in geographic scale and their objectives. Primary networks cover large areas, up to the entire countries. Selected wells are usually at relatively large distances from one another, but still sufficiently close to provide an overall picture of the groundwater situation and to serve as a reference for specific and more detailed local studies. Routine observations of groundwater state variables (e.g. groundwater levels, hydrochemical constituents and temperature) and are performed according to a predefined sampling frequency for an indefinite period of time. Secondary monitoring networks serve more specific purposes such as to locally monitor groundwater pollution or water-table declines around pumping well fields. Many of these local networks are created for temporary studies and are decommissioned when the investigations end (Jousma and Roelofsen 2004). A key objective in designing the network is to provide the required information with as few new wells as possible to reduce costs. This is accomplished by minimising the number of observation wells and the sampling frequency using statistical optimisation techniques and making use of data from the primary monitoring network when designing a secondary one (Zhou 1994; Jousma and Roelofsen 2004). Establishing a legal requirement to monitor groundwater can go a long way in terms of ensuring a properly funded and maintained network. Further, groundwater monitoring networks are ideally designed taking into consideration other relevant monitoring networks for surface water, meteorological data, vegetation and land cover, etc. In countries without established groundwater monitoring networks, local knowledge about groundwater from communities, businesses or academic institutions might be the most sophisticated. However, countries with the capacity to maintain robust groundwater monitoring networks often combine a wide-spaced regional network (primary) with denser networks (secondary) in areas of particular interest. These networks will be linked to different objectives, and the responsibility for monitoring (and its expenses) may be divided between governmental organisations, responsible for overall water management, and organisations with specific tasks or interests (Jousma and Roelofsen 2004). The example of groundwater monitoring in the Netherlands shows how the law can facilitate setting up such networks that observe the state of groundwater resources, inform the policy-making, enable adaptive management and thereby enhance governance. It also shows how citizen participation and decentralised financing mechanisms can help ensure funding and cost-effective monitoring regimes. The main legal framework for water governance in the Netherlands is the Water Law (Waterwet). This 2009 law has replaced eight water-related laws, like the Groundwater Law (Grondwaterwet), and it also implements the EU Water Framework Directive (WFD) into Dutch National Law. The Environmental Law (Wet Milieubeheer) provides an additional framework with respect to groundwater quality protection. The Dutch national government is responsible for defining general water and environmental policies, which act as a framework for lower governmental levels. The national government maintains a national groundwater quality monitoring network (primary network). Provinces are responsible for groundwater policies and management at the strategic and regional level. To this end, they maintain primary monitoring networks in which groundwater levels are measured in all relevant freshwater-bearing layers/aquifers. The networks allow for the analyses of long-term trends at the regional scale, but are not dense enough to map, for example, the highly variable shallow groundwater levels. In addition to the national groundwater quality network, provinces also monitor groundwater quality at yearly intervals in additional wells. A selection of the provincial monitoring wells is also used for monitoring obligations related to the WFD. Lastly, provinces maintain a register of groundwater abstraction rates from all licensed groundwater wells. Municipalities have the first responsibility when it comes to addressing problems with high or low groundwater tables in built-up areas. Many municipalities have implemented secondary monitoring networks of mostly very shallow monitoring wells often just limited to the problematic or risk areas. Since the enactment of the 2009 Water Law, water boards are responsible for the licensing of most groundwater abstractions. Over recent years, the interaction between groundwater and the extremely dense and highly managed surface water systems has received more attention. Therefore, some water boards have started to implement groundwater monitoring as well, in addition to the provincial primary networks. The national laws provide funding mechanisms by allowing provinces, waterboards and municipalities to implement taxes to fund research and measures related to their specific (ground)water task including but not limited to monitoring networks. To limit costs and involve stakeholders, groundwater levels of many wells in the primary groundwater network are being monitored by volunteers, despite manual measurements recently being replaced by measurements from automatic data loggers allowing for higher monitoring frequencies. Historically, this is why groundwater level monitoring in the Netherlands has developed so massively, and it is an early example of stakeholder involvement in groundwater governance. Groundwater users and environmental organisations managing groundwater-dependent ecosystems (GDEs) also participate at different levels of governance by maintaining additional temporary or semi-permanent secondary groundwater monitoring networks. All stakeholders are urged to provide their monitoring data to be included in the national groundwater database (DINOloket) which is maintained by TNO (Netherlands Organisation for Applied Scientific Research), together with other subsurface-related data. The database is freely accessible and contains time series of groundwater levels and groundwater quality for approximately 70 000 monitoring wells containing 239 million groundwater levels and analyses of 136 000 groundwater samples (Jellema 2014). The data are widely used by all stakeholders involved in Dutch groundwater management and policy development. With these understandings in mind, it is important to note that turning the data collected from a monitoring system into information is what ultimately becomes important for governance. Firstly, interpreted results from the primary and secondary monitoring networks must feed back into an ongoing policy mechanism which will continually assess them. Secondly, if problems with depletion or contamination are detected, the governance framework will need mechanisms to cope with such issues. Thirdly, making monitoring data available also allows a range of stakeholders including communities, businesses and academic institutions that have intimate knowledge of the groundwater resources to participate in these processes. In sum, effective groundwater governance should facilitate technically sound groundwater data that are obtained through in situ monitoring networks and should support policy development and implementation. Since the groundwater governance concept emerged in water sector terminology, various interesting publications on this subject have appeared, but only a few of them (e.g. Sharma et al. 2007; Shah 2009; Garduño et al. 2011; Gerlak et al. 2013) explicitly intended to describe in some detail groundwater governance in a particular country or region. To the best of our knowledge, attempts at a global inventory and characterisation of the state of groundwater governance have not been made until recently, when such an initiative was included in the programme of activities of the GEF-supported Groundwater Governance Project, implemented by FAO jointly with UNESCO, the World Bank and IAH. Fundamental inputs from this project to the global inventory were five regional consultation meetings, attended by several hundred groundwater experts from across the world, followed by the drafting of five Regional Diagnostic Reports and one Global Diagnostic Report on groundwater governance. What follows below draws heavily on the outcomes of the Groundwater Governance Project (Al-Zubari 2013; Braune and Adams 2013; Kataoka and Shivakoti 2013; Tujchneider 2013; Chilton and Smidt 2014; Groundwater Governance Project 2016a, b). These outcomes have enhanced the knowledge on the state and diversity of groundwater governance around the world in an unprecedented way, although the available information does not yet allow the presentation of an unbiased and comprehensive description of this state at the level of individual countries. In order to structure the Global Groundwater Diagnostic, groundwater governance was assumed to consist of four main components: actors, legal frameworks, policies, and information and knowledge. Observed conditions related to each of these components need to be viewed against a reference framework that helps identify which of these conditions can be rated as good to satisfactory on the one hand and which critical gaps and flaws exist on the other. Important elements of this reference framework are the area-specific setting, the locally adopted groundwater resource management goals or ambitions, and professional judgement on the governance requirements in relation to the goals to be achieved. In general, governments have the primary mandate and responsibility for groundwater management and governance. Government agencies are responsible for developing an enabling environment (legal framework, institutions, information systems, communication), preparing management plans and implementing them after they have been approved by decision-makers. The extent to which other actors are participating varies strongly from country to country. In some countries (e.g. China, Israel and countries of Latin America and Central Asia), groundwater governance is dominated by government agencies; in other countries (e.g. India), important roles are being played by local communities and groundwater user groups, often assisted or led by NGOs. In many countries, the private sector provides water supply and sanitation services, but nevertheless it rarely participates in groundwater management. In the EU member countries, the European Union plays an important role through its Water Framework Directive (WFD) and Groundwater Daughter Directive on the protection of groundwater against pollution and deterioration. Although successful initiatives have been developed in several countries to enhance the involvement of groundwater users in groundwater governance, in many countries, stakeholder participation remains poorly developed or even non-existent. Only relatively few people have a good understanding of the importance of groundwater for society and the risks of groundwater being “abandoned to chance”. As a result, groundwater is often overlooked by planners (even in water management planning), and political support for groundwater governance and management tends to be low in many countries, especially in relatively poor countries. This lack of understanding often translates into low budgets and low government priorities for groundwater governance. A broad, clear and undisputed mandate is one of the prerequisites for good performance of any government agency in charge of groundwater governance. Unfortunately, mandates are not always clear, and fragmentation of tasks among different government agencies occurs in many countries, quite often accompanied by institutional rivalries. Understaffing, insufficient budget and lack of motivation for proactive groundwater management provide even more serious constraints to effective functioning of government agencies related to groundwater. Such constraints are widespread, in particular in countries where the government’s financial resources are meagre. Many groundwater management measures are aimed at changing the behaviour of local stakeholders in one way or another (restricting abstractions, reducing pollution, etc. ); therefore, it is essential to involve stakeholders in governing groundwater. However, this requires in the first place that stakeholders be capable of participating (in particular, that they understand what is at stake, know how to get their voice heard and be flexible enough to adapt) and that they be motivated to serve the public interest. To date these requirements are fulfilled only rarely. The huge number and diversity of stakeholders and potential actors in groundwater governance suggests that smooth and effective cooperation between them is far from easy. Rather, incompatible goals and diverging interests, lack of trust between different categories of actors and poor communication often lead to conflicts rather than to partnerships and effective cooperation. Finding and establishing a mode of cooperation that fits local conditions and enhances groundwater governance is for most countries crucial and is decisive for failure or success of groundwater management. Herein lies one of the major challenges for improving groundwater governance. Many countries have legal frameworks addressing groundwater, and legal reforms have taken place in many countries in recent years to make the laws and regulations consistent with modern views on groundwater and its functions. Among others, new legislation has in many countries better defined groundwater ownership and user rights, or redefined these. While private groundwater ownership and user rights are predominant in customary law, in many countries, this status has been overruled in recent formal laws by defining groundwater as public property and, consequently, by granting governments the mandate to control groundwater abstraction and protect groundwater quality. The degree of actual government control varies considerably around the world. For instance, constraints to private abstraction are relatively low in several states of the USA (in particular in Texas under the “rule of capture” doctrine), whereas groundwater abstraction is subject to strict regulation in countries like The Netherlands. Implementing the laws and regulations is often difficult or nearly impossible if they are not fully attuned to the realities on the ground, e.g. when “old” and “new” user rights coexist (Spain) or in countries where government agencies simply do not have the capacity to monitor and enforce compliance with the law and where a social culture of tolerating non-compliance has developed. In most countries, legal provisions and also institutional mandates for protecting groundwater quality are completely separate from those for managing groundwater quantity. Similarly, in the majority of countries, the legal frameworks for groundwater are not harmonised with those relating to land use and mining. Synergy can be achieved by better coordination or – where possible – integration. Harmonisation should also be considered in the case of transboundary aquifers expanding over the internal boundaries of a state (e.g. in the case of federal states), where synergy may be envisaged through interstate arrangements or influence of the federal state, while in the case of transboundary aquifers at the international level, domestic legal regimes will need to be made compatible with relevant rules of international law (Mechlem 2012). Not all countries have dedicated policies on groundwater, but those that do show a broad diversity in focus, scope, type, degree of detail and other characteristics. The origin of this diversity lies not only in different country-specific physical, cultural, socio-economic and political conditions but also in the differences in the stage of advancement of groundwater management and governance. Countries in a so-called pre-management stage typically do not have coordinated groundwater abstraction for local uses and lack a realistic notion of the need or desirability to manage and protect the groundwater resources. Groundwater-related policies in such countries usually focus on water supply and sanitation only, in response to short-term needs and without paying significant attention to the broader water resource context. This is followed by the “initial management stage”, during which emerging problems trigger groundwater resource management – still single-issue oriented and only in a reactive mode (“crisis management”). The focus of policies in this stage shifts towards resource control and protection, and their scope becomes wider. In the third stage – the “advanced management stage” – groundwater policies are more comprehensive and adopt integrated approaches to exploitation, they control and protect the water resources, and they are linked to other policy domains. Typical of this stage is also a proactive attitude, manifested by the systematic development and implementation of periodically updated groundwater or water resource management plans. There is a correlation between the stage of advancement of groundwater management and economic development in the countries concerned. Judgments on groundwater policies and attempts at their improvement should take this into account, but even when doing so, several types of inadequacies are widespread and need to be addressed. An excessively limited policy scope is one of the most frequently observed flaws: not only in policies of countries in the pre-management stage (where this is obvious), but even in those countries in an advanced management stage, where inconsistencies with policies of related fields (such as agricultural development, land use, mining, subsurface use, etc.) are often present. Insufficient knowledge is another common deficiency – either caused by lack of data or by poor understanding of the relevant mechanisms of change – which may lead to an incorrect diagnosis of key issues and/or to promoting “wrong solutions”. Inadequate solutions are also promoted in many policies as a result of short-sightedness (short-term perspective of politicians), unrealistic goals, insufficient knowledge of human behaviour, and disregard of the role stakeholders could or should play. Around the world, considerable progress has been made over decades with regard to area-specific information and knowledge on groundwater. Important contributions have been made by the systematic implementation of groundwater assessment and mapping programmes at different scales, the generally observed widening of focus from hydrogeology to a much broader interdisciplinary spectrum and the unprecedented development in data processing and information management, facilitated by information technology. In spite of all the efforts made, many groundwater systems around the world, especially aquifers at greater depth, still remain virtually unexplored. Moreover, although data on time-dependent groundwater variables are crucial to guide groundwater resource management, such data collection and monitoring systems are often short-lived and fragmentary, covering only minor parts of countries and regions. Positive exceptions are countries with a long tradition in groundwater monitoring (e.g. India and The Netherlands) and regions where special programmes favour groundwater monitoring activities (such as EU countries under the WFD). Where only half a century ago most data-owning public agencies and institutions used to be reluctant to share their data with other parties, nowadays a growing number provides online public access to their well-organised databases and information systems. Nevertheless, the data often are still scattered over many organisations, and sharing information is in many countries not yet a common practice or even constrained by major hurdles. Finally, groundwater data and information usually are presented in a digestible format for groundwater professionals. If politicians have to be persuaded to support groundwater governance and if stakeholders have to be motivated and empowered to actively participate, then relevant information should be available in tailor-made formats that suit the needs of these categories of actors. However, such groundwater information products are still extremely rare. To date, 592 transboundary aquifers have been identified throughout the world, a figure that is sure to grow as reconnaissance and survey capabilities increase. Of these 592 transboundary aquifers, 72 are located in Africa, 73 in the Americas, 129 in Asia and Oceania, and 318 in Europe, among which 226 are transboundary “groundwater bodies”, as defined in the EU Water Framework Directive (IGRAC and UNESCO-IHP 2015) (Fig. 11.1). Several previous inventories and assessments of transboundary aquifers at regional level were compiled by UNESCO’s Internationally Shared Aquifer Resources Management (ISARM) Programme (Puri and Aureli 2009). Managing transboundary aquifers coherently requires building trust and forging cooperation between countries, and despite progress reported in some regions, transboundary management instruments and approaches are generally wanting (Groundwater Governance Project 2016a). Enabling frameworks dedicated to support cooperation over transboundary groundwater resources and to achieve good groundwater governance can take a variety of forms from informal settings to the setting up of a joint institution or treaty, and be initiated through different processes, including through externally funded technical projects as in the case of some of the current transboundary aquifer agreements. Such enabling frameworks can have a limited scope, and countries may decide to focus on aspects such as data exchange and monitoring or cover the use and protection of the aquifer at large. When no specifically dedicated framework is required, cooperation can also be achieved through extending the scope of an existing basin institution or treaty to the aquifer (Mechlem 2012). While hundreds of treaties have been negotiated over the use and protection of transboundary surface rivers and lakes, the number of similar instruments specifically dedicated to groundwater resources is extremely low – and where they exist, their impact may still be questionable (Sugg et al. 2015). Studies have shown that the likelihood of tension and conflict within an international river basin is related to the interaction between rapid or extreme changes occurring within the basin and the presence and capacity of institutional mechanisms (treaty or institution) to mitigate such conflict (Yoffe et al. 2003). While these results apply to surface waters, they can give some insight into the potential costs of inaction and challenges to be faced if more efforts are not made to develop and enhance cooperative governance frameworks for transboundary groundwater resources. Legal frameworks are key in groundwater governance as they lay the foundations upon which to develop policies and translate the latter into rights and obligations (Mechlem 2012). At the international level, the main instrument is the 1997 New York Convention on the Law of Non-Navigational Uses of International Watercourses, which entered into force in 2014 and extends to “surface waters and groundwaters constituting by virtue of their physical relationships a unitary whole and normally flowing into a common terminus”, thus only considering unconfined aquifers within its scope. Another global international water law instrument is the UNECE Convention on the Protection and Use of Transboundary Watercourses and International Lakes, which provides more detailed provisions about the former and includes in its scope both confined and unconfined transboundary aquifers. Originally a regional convention, it was signed in 1992, entered into force in 1996 and its amendments opening it for accession to all UN Member States entered into force in 2013. In addition, non-binding instruments such as the 2008 Draft Articles on the Law of Transboundary Aquifers adopted by the UN International Law Commission (UN ILC) and annexed to UN General Assembly Resolution 63/124 (UNGA 2008) and Resolution 68/118 (UNGA 2013) which commends them to the attention of governments, as well as the UNECE (2012) Model Provisions on Transboundary Groundwaters and the 2000 Guidelines on Monitoring and Assessment of Transboundary Groundwaters (UNECE 2000), constitute valuable guidance tools specifically devoted to transboundary aquifers. These global instruments provide states with a general framework for cooperation, which can serve as a basis for the development of appropriate arrangements for the use and protection of groundwater resources, tailored to a particular transboundary aquifer and to the local settings. At the regional level, existing legal frameworks that deal with groundwater include the SADC Revised Protocol on Shared Watercourses (SADC 2000) and the African Convention on the Conservation of Nature and Natural Resources, as well as the EU Water Framework Directive which aims to achieve by 2015 “good status” for all domestic and transboundary waters of the region in terms of quantity and quality and its 2006 Daughter Directive on the protection of groundwater against pollution and deterioration (Mechlem 2012). Groundwater resources are included within the scope of several bilateral or multilateral surface water arrangements; however, only six agreements to date are specifically dedicated to transboundary aquifers, namely, the Genevese Aquifer, the Nubian Sandstone Aquifer, the North-Western Sahara Aquifer, the Iullemeden Aquifer, the Guaraní Aquifer and the Al-Sag/Al-Disi Aquifer. Among those, some agreements may remain generic (Guaraní Aquifer), while others may cover only certain aspects of transboundary aquifer cooperation (North-Western Sahara Aquifer System, Nubian Sandstone Aquifer System) (Groundwater Governance Project 2016a). Although only a few agreements exist at this stage, the number of transboundary aquifer agreements will undoubtedly increase with better knowledge and understanding of the resource. While international water law instruments dealing with transboundary aquifers are still scarce, the provisions of a number of other international law instruments may also prove useful in terms of groundwater governance such as global environmental treaties on carbon capture and storage (Mechlem 2012). Groundwater professionals of most countries are aware of the majority of the gaps and flaws in groundwater governance as depicted above. This is substantiated by the numerous activities intended to improve groundwater governance in their countries, but in many cases, there is no or insufficient progress or actions not addressing those governance aspects that are locally most critical. The aforementioned Groundwater Governance Project has developed a Global Vision to encourage and guide the international community in the endeavours to improve groundwater governance. It intends to be “a Vision of the World in 2030 in which countries have taken appropriate and effective action to govern their groundwater in order to reach globally shared goals of social and economic development and avoid irreversible degradation of groundwater resources and their aquifer systems” (Groundwater Governance Project 2016b). This requires “good governance” with at its heart an effective legal system, capable government agencies, well-designed policies, a structured process for implementing groundwater management plans and mechanisms to facilitate effective participation of stakeholders. Groundwater should not be managed in isolation, but conjunctively as appropriate with other water sources to improve water security and assure ecosystem health. Groundwater quality and resources should be co-managed, and therefore groundwater management needs to be harmonised with land management. Effective groundwater governance requires co-governance of subsurface space. “Vertical integration” is required between national and local level in the elaboration and implementation of groundwater management and protection plans. Coordination should be established with the macro-policies of other sectors – such as agriculture, energy, health, urban and industrial development, and the environment. Groundwater governance is highly context-specific and depends on the hydrogeology, level of development and specific challenges related to the aquifer, as well as on the political leadership capacity to deliver the overall governance and macro-economic interests (Groundwater Governance Project 2016c). Action programmes for enhancing groundwater governance at the national and subnational levels therefore need to be optimally tuned to local conditions. The latter is a prerequisite for convincing decision-makers of the urgency of good groundwater governance and for creating among all relevant stakeholder groups the motivation and determination to participate. The Shared Global Vision for Groundwater Governance 2030 and the Global Framework for Action to Achieve the Vision on Groundwater Governance call for strengthening groundwater governance. This call for action urges countries, districts, communities, companies, organisations and individuals to safeguard the groundwater resource that is essential to meet their common future objectives and sustainable development goals. This Framework for Action is designed to set in place the groundwater governance arrangements that will achieve this Vision (Groundwater Governance Project 2016c). The authors would like to thank a number of colleagues at UNESCO’s International Hydrological Programme and its Groundwater Systems and Human Settlements Section – in particular, Alice Aureli and Marina Rubio for the support they provided throughout the process of preparing this chapter and Aurélien Dumont and José Alberto Gaona Currea for kindly reviewing the first draft. The authors additionally acknowledge funding from the GEF-supported project on Global Groundwater Governance; and author Robert Varady is grateful for support from the International Water Security Network sponsored by Lloyd’s Register Foundation and by the Inter-American Institute for Global Change Research.